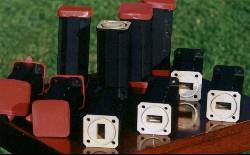 This WR75 wave-guide band stop filter (BSF) component is intended to be located in the receive path between the earth station horn feed and the input to low noise amplifier or block down-converter. Its function is to reduce the levels of any nearby transmit signal that may leak across from the 14-14.5 GHz band and adversely affect the operation of the low noise amplifier in the LNA. This component is not normally required in an earth station which is receive only, such as a domestic satellite TV receive only system. It is however normally required in all earth stations which both transmit and receive. In some cases an additional filter may be required in the transmit path between the transmitter and the feed to reduce the level of spurious signals or noise from the transmitter in the receive frequency band. The band pass loss, typically 0.1dB to 0.15 dB, will cause a small increase in the system noise temperature. The high rejection (up to 60 dB) of the transmit band signals is intended to prevent damage to the LNA or receive band degradation. If you turn on the transmitter you may see changes in the receive signals. Look for: Reduction in receive gain - noticeable by a reduction of noise floor and a reduction of signal. Reduction of G/T - noticeable by a reduction of the difference between satellite beacon level and noise floor. Increase in noise floor. Note that turning the transmitter ON may alter mains or DC power supply voltages and that this (unexpected) effect may also alter LNA performance. To check this try powering on the transmitter with a fully rated dummy load on its output. Flanges: UBR120 at one end, PBR120 at the other end. 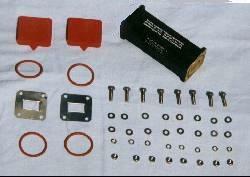 Don't forget gaskets, O rings and correct bolts, washers and nuts. The web site of the manufacturer (www.mitectelecom.com) and email address of my contact no longer works so I am not sure of their current status. Satellite Signals Limited (c) August 2002. Amended 18 Sept 2015, 21 Mar 2019 HTML5.